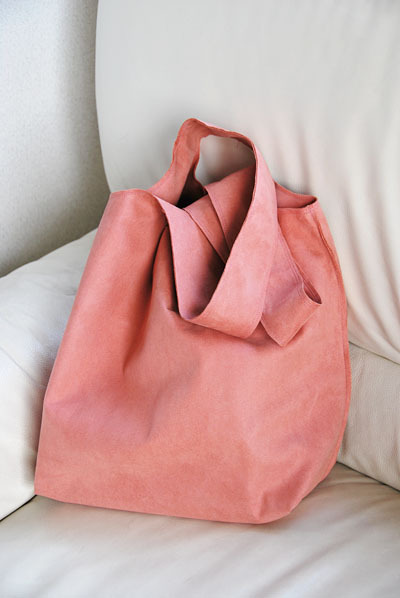 Thank you very much for your responses, I've had some comments and messages about the pattern for my ultrasuede bucket bag. I have no PDF pattern which is ready to cut, but here I post drawings(one in inch and the other in cm) today, for your reference. 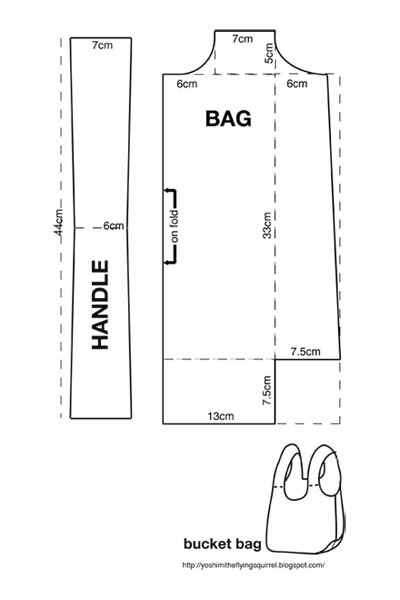 They show the raw dimensions of my bag, so please note that YOU'LL NEED TO ADD SEAM ALLOWANCES that your fabric demands. I got a new bag. 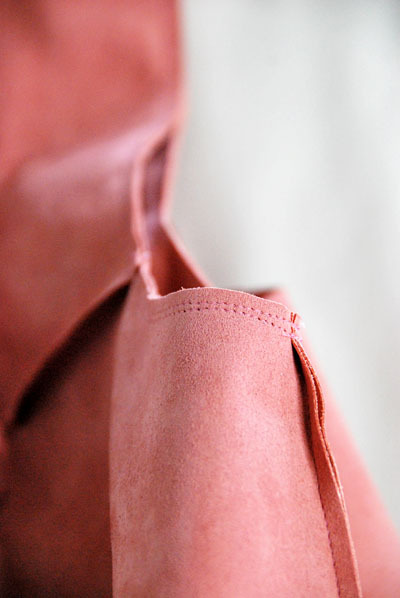 It's a simple bucket type bag made in orange synthetic leather, which was probably Ultrasuede. I bought this synthetic fabric a week ago when I visited Nippori to accompany Carolyn and Novita for a fabric shopping. It was a very lovely day and we had a great fun with our hunting out. Because Carolyn brought her beautiful daughter with her, and my friend Miho joined us after shopping, we became a big girly fun party in the end. This fabric is my happy memory of the day! 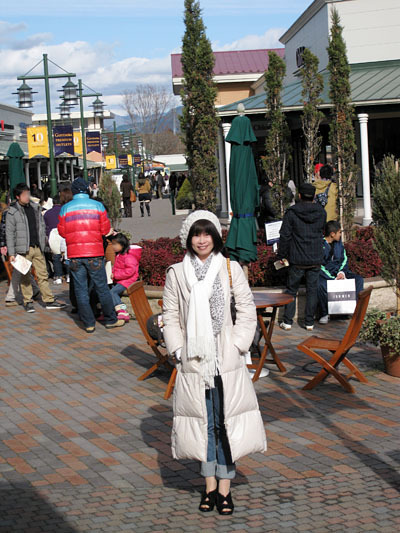 If you are interested in how a tourist feels in the fabric town in Japan, drop by Carolyn's blog regularly as she told me that she would post her holiday story including her Nippori adventure in a short time. 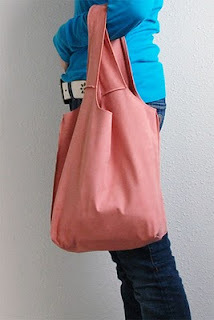 For the bag, I used a self-drafted easy pattern. 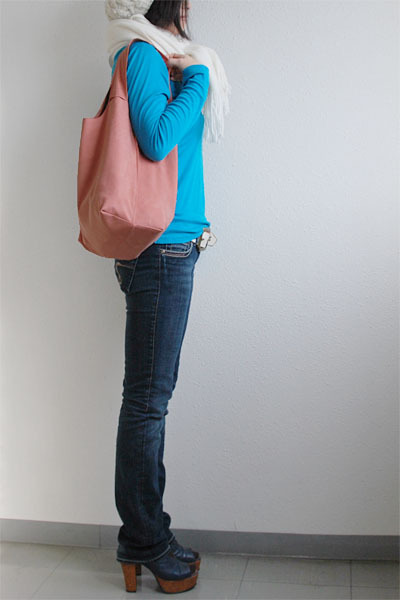 The bag is lined with a marimekko cotton fabric, which was a leftover of this parasol project. I have put a pocket inside for my keys and such things too. I sewed the outer and the inner(lining) bag individually, and then assembled it in the last step by stitching around the handles, having the raw edges of handles outside. The seams at the root of handles were intended to be there for making the area slightly sturdy horizontally, as I didn't want the handles to wrinkle at the area vertically. Despite of a very quick project, I am very satisfied with the result so far. All I have to do is to check the durability of this fantastic synthetic leather for this purpose. Let's see how long it lasts! It's been looking good, working super, and totally being awesome to me. Why do I look this grumpy in the photo? Because the place wasn't bright enough for the photographs and I needed more sunshine. And because I also knew I was carrying numberless creases on my tummy. But in my heart, I had a grin because I like my latest result secretly. One day I was sitting at home and looking at ELLE online Japan, and saw a off-duty runway model wearing a black gauze-looking gathered maxi skirt with a very plain copper brown boat neck pullover. Her outfit could be described as too simple, but I found that she looked absolutely gorgeous and very up to date. The photograph made me try what I've never tried before in my life... a maxi skirt. After a long thought, my skirt became very different from the one that inspired me, but I say it's OK. In the end, I decided to make it deliberately boring. The skirt is way too long to deny it's funny anyway, and I wanted everything about it, except the length, to be very simple and silent. I may have thought differently and chose a bold flowery fabric if it were summer. But at the moment, I liked it calm. 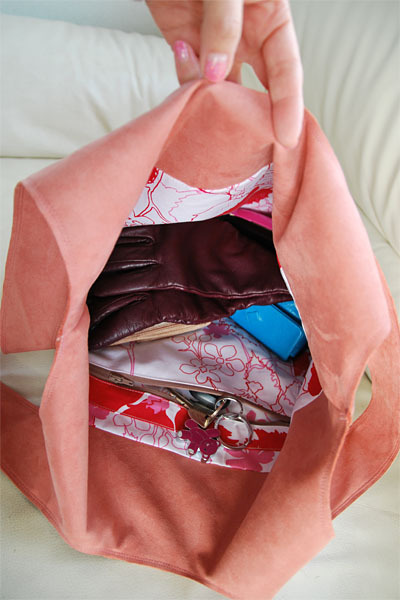 I also sewed a set of turtle neck and cardigan in peach pink. The fabric I used for them is very thin and delicate wool jersey, and because it causes thousands of creases like gills of mushrooms, I know it looks very NOT nice through the camera lens. Ah... I'm not happy with the pictures at all, but what can I do? That said, the creases are not so disturbing in the real life (probably because I rarely look at my self in the real life...haha) and actually I really love this twin set on me. The color brighten up my eyes and I like the effect. 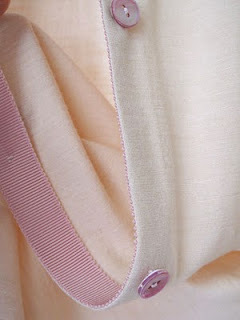 Bias tape binding on the waistline, waistband omitted, lined, back zipper moved to the left side. Cut 5cm at hem to shorten. fabric: slightly felted wool jersey, bodied and slightly heavy. Stretches moderately. 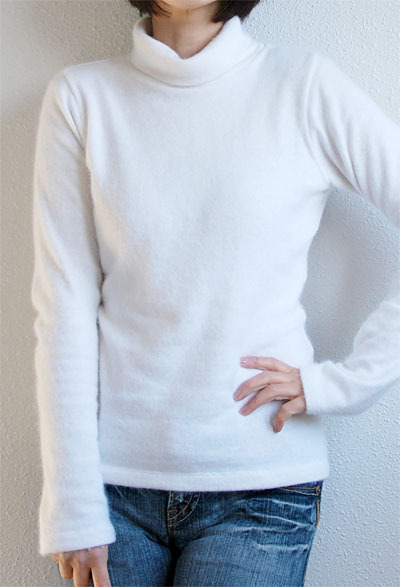 sleeves were lengthened (about 5cm). I'm having a giveaway for celebrating this blog's 2nd anniversary. Please visit the post if you would like to enter the raffle. It will be closed on 14/January/2011. I was wishing to have a warm pullover for fighting with the shivering winter, and I found a pretty fabric. The problem was that, I needed to choose its color. 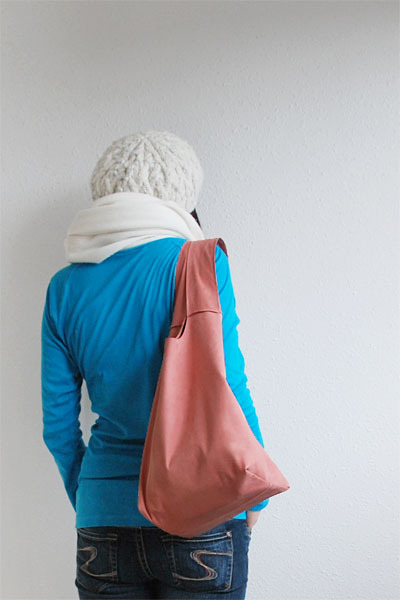 The shop had four colors (white, lavender, pink and mustard) in stock. Which color do you think I chose? They are pretty much same, albeit I made them in different sizes and adopted different types of neckline. I wanted to wear the white one loosely. Meanwhile, the lavender one is to be fitting snugly to wear under the layer and also has a small option to show its pretty color (like in the fourth and fifth pictures). By the way, I'm the one of long-armed creatures, and I lengthened the sleeves quite a lot. I'm very happy with my new sleeves that are generously covering and warming up my arms. The sleeves make them look warm and relaxed, and I love it. 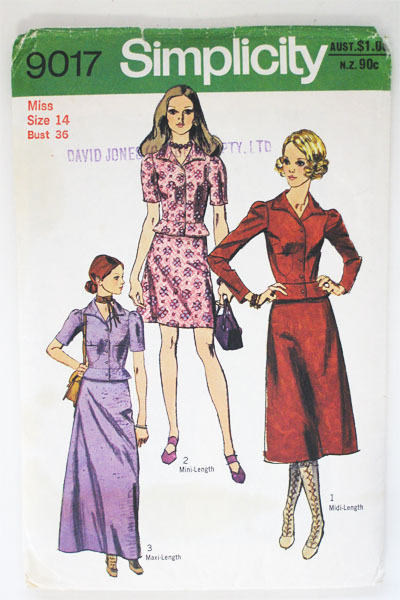 Apart from the original fitting issue, I kinda believe that controlling what size, length, and fit to choose is a part of "dressing beautiful". (Maybe I should say "invisibly dressing nicer"? ...sounds even dodgier.) I know I'm talking it too much but I honestly think we who sew are really lucky. If you would like to see my sad arms in a typical ready-made pullover, which has already been washed more than several times though, see what happens here (I'm kinda unconsciously hiding them, ain't I). According to the shop information, TAMANEGI-KOBO is now considering to translate some of instructions of their patterns into English for the English speaking customers. If you already think of some particular patterns and would like to make a request for getting your favorite ones translated earlier, they are waiting for you to hear your say at their shop page. The product name of the exact gadget that I'm about to give away in this post is "マールサシ", and the name of the company is "河口株式会社" (KAWAGUCHI Co., Ltd.). They seem to have no English homepage but they do have a PDF catalogue which you can get at their Japanese homepage. 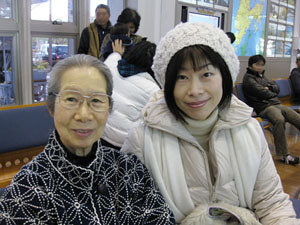 I guess I should visit my mother soon again to check the detail of her jacket... You all are right, I should have done it, really!! I hope you had a wonderful Christmas and a lovely holiday! I too had a great time while I was away. Lots of traveling and many lovely meetings. 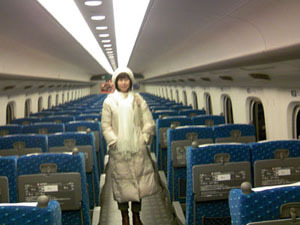 Because virtually I was on the journey all through December, I wasn't at home much. Therefore I have nothing to report on sewing particularly. I think you can see in the pictures that I was SO busy, because they prove that I never had a single chance to change my clothes during this period, apparently. 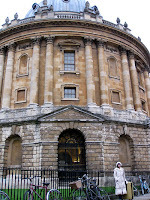 In front of The Radcliffe Camera, Oxford. I visited London for attending a symposium which was held for celebrating my former boss' brilliant career and his recent retirement. 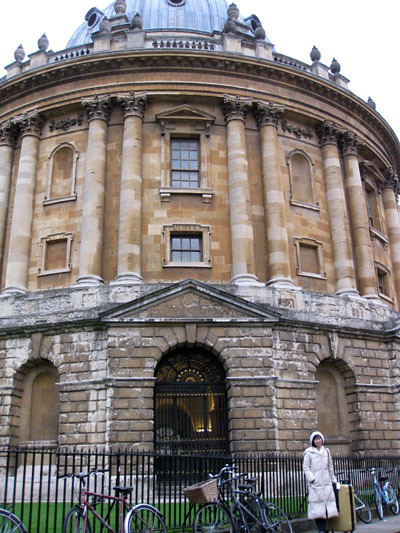 I also visited Oxford, for the first time, to see one of my friends too. 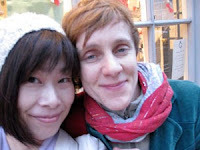 In London, I met Helene, aka CarotteSauvage the great hobby seamstress, and we had a great time. We chatted chatted chatted chatted chatted and chatted (you have to read it as "Helene talked interesting stories all the way and Yoshimi chuckled forever with making strange noises." She's so funny, clever, and quick-witted. I know that she doesn't read blogs, but we agreed that this picture should be put in my blog sacrificing its face-less principal. I went shopping to a gigantic outlet shopping mall (in Japan) with my family too. Hooray, I didn't buy anything for me! (I bought two pieces of clothes for my daughter and that's all.) I have decided not to buy my clothes entire this year. By the way, in case you don't know much about me, I describe myself that I'm just a 40 and a half decade years old very ordinary typical female mad molecular biologist who wore an white hand-knitted hat and an white coat all through December. I happen to be a hobby seamstress too. I started this blog about two years ago. This was one very personal murmuring from the beginning and it still is. Most of the time I have no spectacular blasting or shining originality in my sewing, I have nothing to promote or to sell either, but I hope you can feel through this blog that there is me living somewhere on your same planet and sewing happily and singing (badly) to make her days a bit brighter in her way. I hope the fact that you are not a lonely sewist but you have me as your company makes your hobby merrier. Thanks all for your visits, I have a small giveaway for celebrating my second blogversary. If you are interested in it, please leave your comment with a link/address with which I can contact you later. The kind seamstresses who don't care about the giveaway but would like to leave comments will have to acquit me of your enforced submissions to the giveaway, please. The giveaway raffle will be closed at 23:00JST on 14/January/2011. You can submit for it as long as the shipping address is on our planet. I'm planning to use the random number generator for choosing one winner but I will change my mind if I find a better way for random drawing. I'll announce the winner soon after the drawing and also send a personal message to her/him. Any questions? 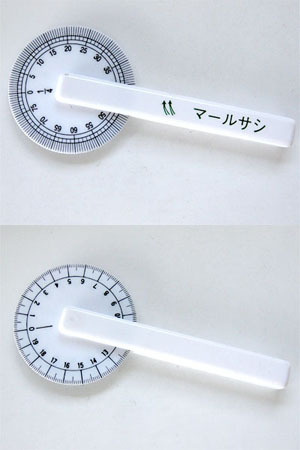 The giveaway prize is "Ma-rusashi" (KAWAGUCHI Co.,Ltd) which is a plastic rotary measure (ruler/curvimeter). 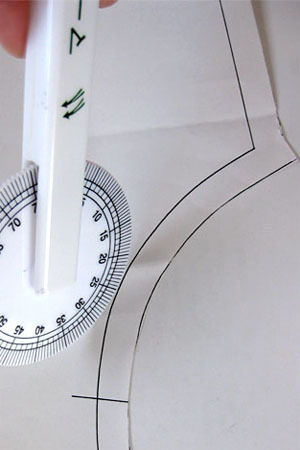 It is very handy for measuring curved seams on paper patterns! It has got inch and centimeter notations on each side. The tool is widely available in Japan, but I couldn't find similar tools when I was checking the term for it in English. I guessed that this plastic sewing tool might not be very common in many countries and decided to let you know how much I liked it. Yes, I definitely prefer it to any other measuring tool, especially when I check the length of seams in armholes. Do you already have a similar tool in your tool box? If not, be a lucky one and let me send it to you. A Happy New Year and Happy Sewing to all of you!